The summer months call for competitive movie releases all fighting over who can be named “Movie of the Summer”. From long awaited sequels to low-budget independent films, the scheduled releases provide entertainment for all walks of life. The summer is a time to relax, sip some lemonade and enjoy the influx of blockbuster films that premiere between June and August. For the last few years, release dates have been orchestrated specifically to compete for the title of “Movie of the Summer.” From superhero flicks to horror films, these are the titles that viewers are most looking forward to. Relying on the success of the original film, “Ocean’s Eleven”(2001), this star-studded remake features an all-female cast in contrast with the original. The concept calls back to the “Ghostbusters”(2016) remake that drew in a lot of criticism from fans. The plot follows Debbie Ocean (Sandra Bullock), who puts together a team of specialists. Instead of going after a casino, the team plans a heist of the Metropolitan Museum of Art during itsannual gala. Similar in tone to “The Witch”(2015), “Hereditary”takes a step back from the jump-scare culture that modern horror films have resided within. The plot follows the Graham family after the death of their elderly matriarch. The family begins to discover secrets about their ancestry and their reserved grandmother. Rather than rely on cheap CGI, the film focuses on the tension that surrounds the relationships between family members. The long anticipated sequel to the original “The Incredibles”(2004) is finally being released.Pixar fans have anticipatedthis sequel ever since the open ending of the original film and the release of other popular Pixar sequels. The plot follows Elastigirl as she pursues a career in crime fighting, all while Mr. Incredible is given the task of taking care of their three children. The film brings back multiple fan-favorite supporting characters like Frozone and Edna Mode. Marvel has had an incredibly busy year with its consistent releases. “Black Panther”and “Infinity War”both drew in millions of dollars for the company, and they continue to one-up themselves with another Ant-Man film. Just kidding. Although Ant-Man isn’t the most popular Marvel character, and was even omitted from “Infinity War,”Marvel’s ability to continue a consistent production rate is impressive. The film follows Scott Lang as he tries to balance fatherhood with crime fighting alongside his newly appointed partner, the Wasp. The eighth grade has long since been repressed, but writer and director Bo Burnham is able to bring all of that awkwardness back to the surface. The film takes a fresh look at the coming-of-age genre. Rather than use a model-esque actress in her twenties to portray thirteen-year-old Kayla, Burnham uses acne-clad Elsie Fisher. The film is grounded by these child performances without coming off as forced. Another sequel that fans have been waiting for is a follow-up to“Mamma Mia”(2008), or at least my mom has been waiting for a sequel. The ABBA-filled film returns for a look into Donna’s past and her relationships with Sophie’s three fathers. In order to compensate for the callback plot, the film has been recast to show the characters in their youth. This means that Meryl Streep won’t be singing ABBA for another two hours, which is unfortunate. Disney continuesits callback to original animated films through live-action films, however, “Christopher Robin”looks at the story of Winnie-the-Pooh through the eyes of an adult Christopher Robin. The film combines animation with live-action in different segments. Rather than following the path of the live-action “Beauty and the Beast”(2017) or “The Jungle Book”(2016), “Christopher Robin”doesn’t just remake the original content but instead offers a new story. This film sits right between “Sharknado”(2013) and “Deep Blue Sea”(1999). It’s not completely laughable, but it can’t be compared to “Jaws.” The film doesn’t take itself too seriously, which makes the giant CGI shark way more entertaining. Filled with one-liners and explosions, the summer is not complete without at least one shark film. Based on the popular 2013 novel of the same name, “Crazy Rich Asians”is a romantic comedy about family and class relations. The plot follows Asian American Rachel, who travels to Singapore with her boyfriend only to find out he comes from an incredibly wealthy family. Problems arise when her boyfriend’s mother begins to disapprove of their relationship because of her different class status. Samantha Vargas is the asst. 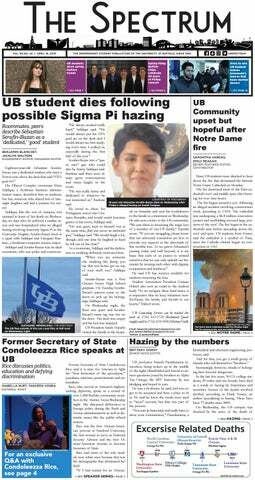 arts editor and can be reached at arts@ubspectrum.com.